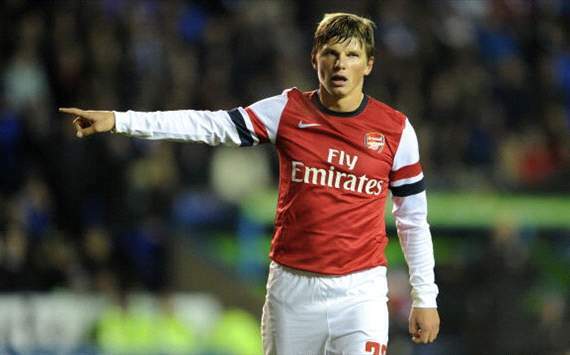 Andrey Arshavin is close to sealing a £4 million move to Reading, Goal.com can reveal. Arsenal have given the Russian permission to hold talks with the Premier League's bottom club and a deal is expected to be completed in the first week of the January window. The Gunners and Reading are negotiating the fee, which is expected to be around the £4m mark although the north Londoners could try and hold out for £5m. Sources have told Goal.com that Arshavin has played his last game for Arsenal and the transfer should be completed early in the window. Arsene Wenger has sanctioned the sale of the 31-year-old, who has not started a Premier League game this season and has not figured at all since the manager fielded a weakened team for the Champions League trip to Olympiakos on December 4. Fulham and Arshavin's former club Zenit St Petersburg were also interested in signing him next month but Reading have made their move in a bid to arrest the club's freefall back into the Championship. The deal has been sanctioned by Russian owner Anton Zingarevich, who was criticised by winger Jimmy Kebe last week for not buying enough players with Premier League experience in the summer. Arsenal are keen to agree a straight sale rather than another loan in order to recoup some of their £15m outlay on the forward during the 2009 January window. Although the former Russia captain spent his entire career at Zenit before joining Arsenal and returned to Saint Petersburg for a second spell on loan last season, his preference is to remain near London. Arshavin and his family are settled in the capital and would prefer to extend their time in England rather than head permanently back to Russia. The winger is set to link up at the Madejski Stadium with his countryman, Pavel Pogrebnyak, who was made the highest paid player in Reading's history when he joined from Fulham on a salary believed to be worth £60,000 a week.